If you haven't experienced them yet, you will want to check-out Big Green Truck Pizza! 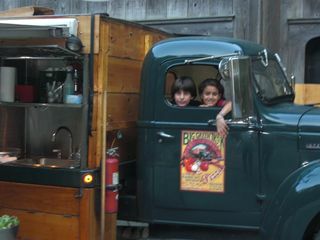 They are a one-of-a-kind catering service that hosts pizza parties from the back of an antique truckwhich has beenspecially outfitted as a mobile pizzeria.Not only that but they bring all the materials and equipment (right down to dessert and paper goods) you need to pull-off anawesome backyard picnic with fabulouswood fired pizza. 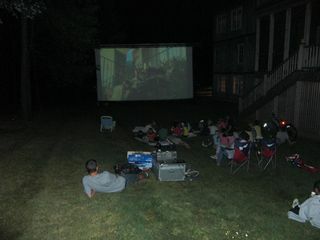 A few weeks ago, we had the pleasure of hosting a backyard movie night and pizza party for a ton of kids and their families. With the help of the Big Green Truck Pizzaand Big Wave Events, who provided a large movie screen and projector for a drive-in style showing ofThe Karate Kid (the original! ), the night was a bigsuccess.